A few months ago, I submitted a blog post that I'd written here on HopeShining to "The Rebelution" - a blog started by Alex and Brett Harris, the authors of "Do Hard Things." Well, I heard back from Brett and was blessed to be asked to regularly contribute to the Rebelution Blog. I am so excited to be a part of what God is doing through their blog! Their site really is an incredible place to be challenged and encouraged, and it is specifically geared towards young people (which I really love!) although it is definitely applicable to many different people at many different ages. Earlier this month an article I originally posted here (<<<click that word "here" to see the original post) was posted on their site. 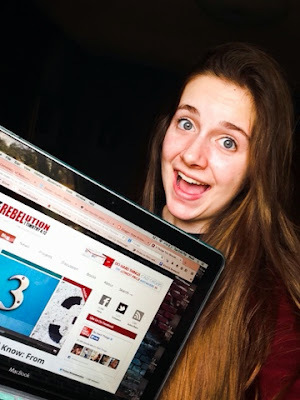 You can see it - "3 Things You Should Know: From One Teenager to Another" - on The Rebelution by clicking here! In August my first article was published on their blog. You can see the original Hope Shining post by clicking here. To see it - "College Applications: If God is For Us, Who Can Be Against" - on The Rebelution Blog, click here! Please keep the readers of The Rebelution in your prayers; it is such a birthplace of amazing works for the Kingdom!